Allows you to automatically register and process the parameters of vehicle operation (basic parameters, fuel, route all recorded at 1/[min], all other events recorded at the time of occurrence). Depending on the type of connected external devices, you can obtain very accurate data on the operation of the vehicle/machine, and also on the work of the driver/operator. The reliability of the recorded data is secured by parameterized entries, which provide connection for external devices (fuel system, tachograph), allowing you to monitor any external interference. Allows you to transfer data from vehicles/machines to PC via GPRS (in real time). Enables rapid analysis of faults and third party interference and a possibility of software repair by service people. It is a small device (the size of an alarm system remote control) in the possession of a driver/operator. It is used to identify the driver/operator of the machine. All data recorded in the CENTRAL MODULE are transcribed to the recorder. 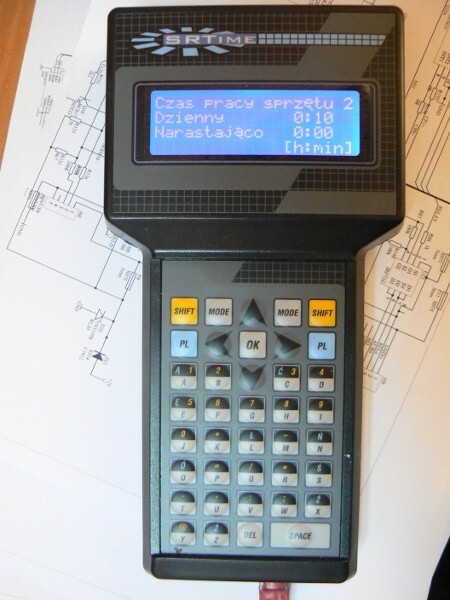 An electronic device which allows you to measure the distance covered by of the vehicle or construction machine and to record its speed in real time. A sensor which allows to measure the working time of additional devices fitted in the vehicle/machine, such as: lift or vibration pump, sand-spreader, plough, tipper and other. Alphanumeric Terminal An all-purpose panel equipped with a display and keyboard. It enables typing data in (for example, the place and purpose of a layover, refuelling, order-giver, quantity of goods etc. ), while giving the driver/operator the possibility to access and view the information on the performance of vehicle/machine (time, fuel consumption, volume of fuel in the tank, route covered etc.). The device is equipped with a filter, deaerator and a Swiss flow meter, enabling the measurement of consumed fuel with 1% accuracy. Our special manner of measurement allows for such accuracy. Only the fuel consumed in a given moment is measured. An electronic fuel flow sensor for special applications and requirements (e.g. warranty), which is mounted through non-invasive connection of sensors with the installation. A device fitted in the vehicle’s/machine’s fuel tank which allows you to monitor in real time the level (volume) of fuel in the tank.